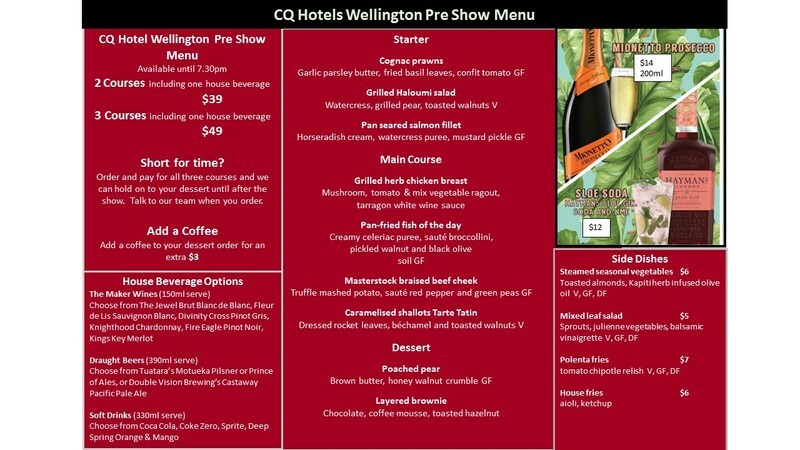 CQ Hotel Wellington Pre & Post Show Menu. Are you in Wellington for a show? Join us for your pre - show meal from 5pm. Enjoy a 2-course meal with a glass of house wine for just $39 per person. Or make it three courses with a glass of house wine for just $49 per person. Menu is available 5pm - 7.30pm 27th September - 39th September, 4th October - 7th October, 10th October - 13th October, and 5.30pm - 9.30pm on Sunday 30th September and Sunday 14th October.